Matching the right plant to the right place is the secret to success. Digging a hole 1 to 2 feet deep in spring or up to a month before transplanting gives a plant a place to grow in the ground. The hole’s diameter should fall between 1 to 4 feet, though 1 to 2-foot holes may be preferred for smaller plants or non-bumper-crop years. The four-footer used in a hot summer in full sun would be a high-yielding, low-maintenance choice. Another option is to dig a 1 to 2-foot deep trench that is 1-foot wide (or more). Where should the digging take place? In sandy soil if it is possible to water frequently in hot summer months. Excellent for regular feedings, sand helps warm the soil. In clay soil if decent water and nutrient retention is wanted so that only a few visits are needed. Clay soil is cooler than sandy soil. In bog soil if it is not too mucky. Good bog soil / peat will compact when it is squeezed and crumble when it is broken up. Watering is eliminated in a good bog. A grower must be careful because a good bog one year may flood in another year. Developing a relationship with the water table is necessary when planting in a bog. If the bog contains water pools and it is coated with sphagnum peat moss, flooding should not be a problem, even in the wettest years. On a rock cliff. Here, instead of a digging a hole, the site is made 2 to 4 feet high with mix. This is the best bet for a wet season because of drainage, electromagnetism possibilities, and the possibilities of altering root temperature for proper warmth. Using the proper container size is the first step. In other words, how big should the plants be grown? All things being equal in the mix, the larger the container, the larger the plant. However, to grow the larger plants, capitalizing on a full growing season is a must. Late-starting plants have a limited growth potential, so in this case growers often use more plants to grow big flowers on the smaller plants. For the highest possible yield when putting plants out in the early spring after the last threat of frost, it is recommended to use at least 15 to 20 gallons of mix per plant in a garbage bag, garbage can, or a box 3 feet square x 2 feet high (all well-draining). For smaller plants and late starts, using less mix is less wasteful. A 1 to 3-inch layer of mushroom manure or steer manure in the bottom of the containers will provide nutritional fuel for the feeder roots that will bunch up at the bottom. Forgetting to feed the bottom roots is probably the biggest omission in the plant’s diet, unless supplemental feedings are frequently applied. A layer on the bottom cuts down on feeding maintenance. For late transplanting, using a container ranging from 2 to 5 gallons will work fine, depending on how much of the season will be dedicated to vegetative growth. For example, in Northwest Washington State, a female clone transplanted in July may begin to flower soon after the transplant, leaving only a top flower. Therefore, a 2-gallon container will be sufficient. Lining up all the containers side by side and growing a Sea of Green is a possibility when small plants are grown for the top flowers. Another female clone may vegetate for 2 months, and finish flowering in mid-October. In this case, a 3 to 5-gallon container could fill up with roots. Getting to know strains inside and out allows a grower to learn how to match the right plant with the right container. The advantage of container plants is that they can be brought indoors to finish budding (i.e. at 2 to 3 weeks) under lights. This can make some plants more potent, looking like they were grown indoors. Some plants will be less potent grown outdoors. Sometimes when plants are grown outdoors, making a quick decision is part of the program, such as saving plants from molding. A quality homemade mix can be made with peat moss or forest compost, or may be prepared with a soilless mix that is purchased from the store. Store-bought goods are easier to work with because the pH is at the desired level and it is mixed with perlite and / or vermiculite, lime, and other goodies. On the other hand, homemade mixes are a lot cheaper, often less than half the price. When soilless mix is purchased, it is sterilized and has a pH that needs no further adjusting. However, forest compost and peat moss can be substituted with soilless mix. The key is to get the pH right (5.5 to 7.0). Most forest compost has a pH of 5.2 to 5.5, while peat moss has a pH of 4.0 to 5.5, depending upon the source. When perlite and lime are added to peat moss or forest compost, the outcome is a basic soilless mix. A. 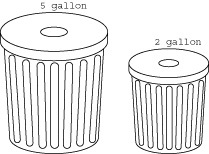 A 20-gallon garbage can (like the cheap Rubbermaid®) is filled 2/3 full with rich, black forest compost or peat moss. B. Perlite is then added to the top. Then the mix is mixed thoroughly in the can, or it can be emptied onto the ground and mixed with a pitchfork or gloves. A respirator or good dust mask should be worn for all mixing. C. 5 to 6 cups of fine dolomite lime and 3/4 to 1 cup of hydrated lime is added and thoroughly mixed in. Forest compost and peat moss are good mediums for affordable homemade recipes. A grower can make homemade mixes before following the examples for adding fertilizers to the homemade soilless mix. The pH should be higher than 5.5 and less than 7.0. Forest compost comes from a mature forest. It exists in a mature forest under a layer of sticks and needles. It is located a few inches beneath the needle layer. Some stores sell forest compost mixtures. It is usually free of stones and has a ph greater than 5. All loose roots should be removed from forest compost before it is used. D. A fertilizer combination is added to the soilless mix. There are 8 recipe examples on the next pages. 1. Four 3.8 to 4 cubic foot bales of Sunshine® #2 Mix, Jiffy Mixtm, Pro Mixtm, or other soilless mix. 8. Up to one-third parts soil. 1. One 3.8 to 4.0 cubic foot bale of Sunshine® #2 Mix, Jiffy Mixtm, Pro Mixtm, or other soilless mix. 2. One 10kg bag of Welcome Harvest Farmtm Flower Power. 6. Up to one-third parts soil. 1. One 3.8 to 4.0 cubic foot bale of Sunshine® #2 Mix, Jiffy Mixtm, or Pro Mixtm. 2. 5kg of Welcome Harvest Farmtm Flower Power. 6. 1 quart of greensand. 1. One 3.8 to 4.0 cubic foot bale of Sunshine #2 Mixtm, Jiffy Mixtm, or Pro Mixtm. 9. 0 to 50 quarts of any combination of perlite and vermiculite. 10. Up to one-third parts soil. 2. One bag of mushroom manure (20 to 30 quarts [liters]). 8. 2.2kg of Welcome Harvest Farmtm Flower Power. 4. One 5kg bag of Welcome Harvest Farmtm Flower Power. 5. Perlite / vermiculite combination, as desired. 9. Up to one-third parts soil. 3. 20 quarts of well decomposed compost. 7. Up to one-third parts soil. 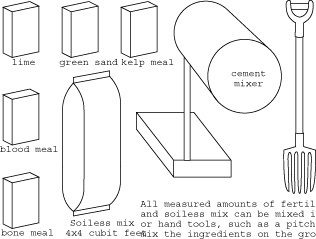 Why is soilless mix used? It is made from organic peat, which holds nutrients, moisture, and air very effectively. It is versatile for all climates, and the grower has complete control over the fertilizing of the grow medium. Also, it is pH buffered which allows pH control. To put it simply, it allows the grower to get high-end results with minimal effort, for it does most of the work. Calcium peroxide, available under many trade names, can be added to any mixture. It breaks down into oxygen and lime. Kelp meal and greensand are good sources, and so is langbeinite. Crushed granite is good too, but it should be the type that contains a decent supply of potassium feldspar. Greensand releases slowly and for more than a season. Nevertheless, a cup per plant each year is good to add. Kelp has a single-season limitation. There is no substitute for the many trace elements that kelp releases. However, many mined minerals work well too, such as greensand, Pyro Claytm, and Mineral Magictm. Some liquid organic fertilizers, such as Earth Juice® and Meta Naturalstm have formulas that are made to contain trace elements. For an underground garden, the mix should be placed into a proper hole. Building a 6-inch to 2-foot raised bed above the hole allows for extra drainage, warmer roots, and more predator control. An option is to apply a manure layer on the bottom of the hole, before the mix is deposited into the hole. For a container garden, a grower should fill up the containers and moisten the mix before transplanting. Transplanting is discussed on pages 106 to 107. Additional liquid, or water-soluble powder fertilizers used at half strength to full strength, are safe additives every week or two. Organic fertilizers work well on their own, but they can be used in conjunction with chemical fertilizers. Many growers use dried and water-soluble organic fertilizers throughout vegetative growth, then switch to chemical fertilizers during bloom. Another approach is to use a synthetic blend of water-soluble chemical fertilizers during vegetative growth as well. Often a single application of a cheap chemical fertilizer during vegetative growth will push a plant further than no application at all. All formulas given already in this chapter will work, but here are some more that have done well for plants in vegetative growth or flowering. During vegetative growth, applying one or more applications of a water-soluble chemical fertilizer, such as half to full strength 20-20-20, will produce more vigorous growth. Adding epsom salts (1/2-teaspoon per gallon) and the recommended rate of liquid kelp works well with a synthetic chemical blend. Note: Since every part of the world has different environmental conditions, optimal combinations of organic and chemical fertilizers will be different in different areas. For example, in areas of high rainfall, rain leaches the soil every year. In the desert, salts will accumulate. Studies have shown that in the rainforest, upwards of five chemical fertilizations in a single season would not repel earthworms from a mix the following year. This may not hold true in another location. During bloom, use one to three applications of a water-soluble chemical fertilizer such as Miracle Grow® 15-30-15, Plant Prod 15-30-15, General Hydroponics® Bloom, Supernatural®, Advance Nutrients, or Dyna Bloom. The dose can range anywhere from half to full strength. Epsom salts (added at 1/2-teaspoon per gallon) and the recommended rate of liquid kelp can be added to the chemical fertilizer, too. Fertilizers should not be added for the last two to three weeks of blooming. If a grower forgets, plants must get a good flushing to remove salts in the growing medium no less than a week before harvesting. Quality will be a borderline issue. However, flushing with plain water or a flushing solution may be needed to give the product a final, quality touch, especially for those plants receiving heavy feedings. In addition to supplemental feeding, frequent watering during the hot summer months may be needed. When the mix feels dry to a depth of 6 to 8 inches or more in a 1 to 2-foot raised bed or other permanent site, a grower should water the plants. Container plants will consume different amounts of water for different container sizes. For example, a dry 5-gallon bucket with a plant may need 1 to 5 gallons of water, depending on the situation. Another plant in a dry 20-gallon can may need 5 gallons but prefer 10 gallons. Plants that receive a good supply of water grow better. There are many possibilities for dealing with the water supply; for example, a gravity feeding unit, a portable electric pump, black plastic water traps, water drums, a solar pump, a gas water-pumping system, or a well. A sprinkler system can be attached to a flowing water supply. Another approach is to cover a plant site with a thick layer of straw, bark, weed-free hay, sphagnum peat moss (if available at the site), black plastic, or wood chips, all of which help retain moisture in the mix. One grower placed a 45-gallon drum in a flowing body of water and connected a series of tubing that became gradually narrower, resulting in a lot of pressure buildup in the line, which forced the water uphill to the site. Burying buckets and garbage bags instead of exposing them will cut back dramatically on watering maintenance, especially in moist areas. Placing a Myco Pak under each plant at transplanting time seems to lower watering needs. It is critical that a grower understand the direct and overlapping relationships between strain, timing of transplant, quality of mix, and container size, to mention only a few issues. A grower should get his feet in the water to get a grip on these realities. Placing the garden in a moist location is the easiest and cheapest way to grow a low-maintenance garden. 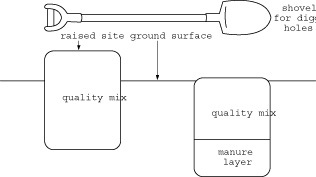 When procedures in this manual are followed, the final product should be of top quality. However, flushing plants with lots of plain water two weeks before harvest and upwards until harvest can remove lots of salts. This flushing will improve the final product. In general, these formulas with organic mixes should work out fine without the need for flushing, unless many supplemental feedings are added. A major benefit of organic fertilizer use, is that salts are not a by-product of organic fertilizers, unlike chemical fertilizers, especially the cheap ones. Flushing is often more necessary for chemically grown plants, so that the outcome is produce of a higher quality. In most cases, using too many chemical fertilizers will affect the final quality if they are not flushed out of the mix. If making one to five applications of chemical fertilizer in a single season during vegetative growth and the flowering process, the mix will not deal with the detrimental levels of salt buildup, even without doing a serious flush. Nevertheless, adding a few doses of chemical fertilizer during cultivation can increase the volume, without sacrifice to quality. If flushing is necessary, using large amounts of plain water or one of the many flushing formulas available in the market today is recommended. These flushing formulas attach to the fertilizer salts and unused elements in the growing medium so that they will be removed. Some clearing solutions come in flavors like pina colada and strawberry. Some flushing formulas should be followed up with a dose of plain water in order to remove an undesirable flavor.